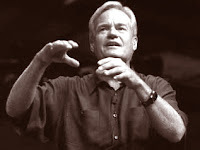 With Teaching Pastor Mike Breaux leaving earlier, the departures of Randy Frazee and Gene Appel subtracts two more teaching pastors away from the Willow team – essentially leaving Bill Hybels by his lonesome (Nancy Beach does teach some but not nearly like the four men have). There is no question that these are big waves in a church which has influenced thousands of churches around the world (including mine). I also know it’s easy to jump to conclusions (admittedly not good ones with these types of situations). It won’t take long for the blogosphere to be abuzz with empty speculation, unfounded judgment and “holier-than-thou” opinions before anything really is known – if there really is anything more. However, I would suggest praying for Willow (Hybels & Co.) during this season that God would be glorified through it all. Whether or not you’re a fan of Willow Creek (or the seeker-sensitive movement as a whole), I believe we would do well to intercede on behalf of a church which has held a very strategic place on the Evangelical stage. Where did Mike Breaux go? Wow, maybe we should apply? :)!